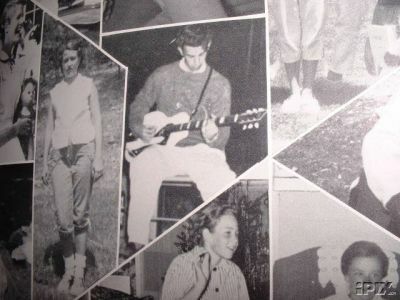 Frank Zappa in a 1956 high school yearbook. Afterwards, FZ attended the Antelope Valley High School in Lancaster, CA, usa. 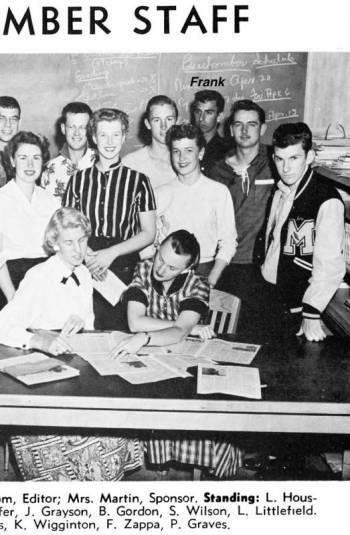 he is mentioned in the 1957 and the 1958 yearbook. 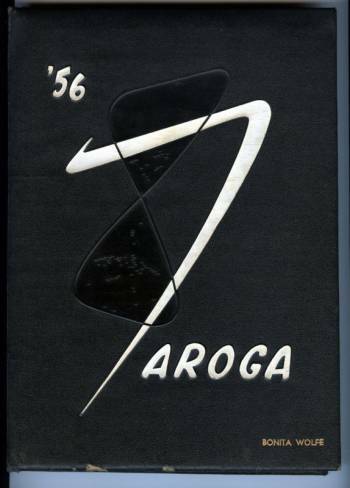 Here are some shots from a 1956 high school yearbook from the 1955 - 1956 school year. "Frank appears in TWO great early photos!! 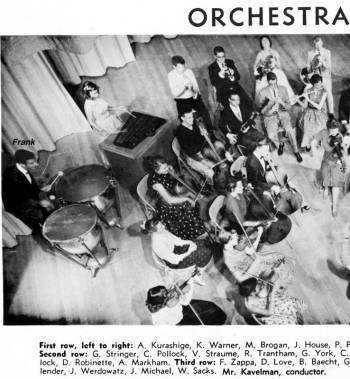 The first shows him in the Orchestra sitting at the drums (his name is clearly labelled). The second is as a member of the Beachcomber (probably school newspaper) staff, again where he is clear and his name is in the caption. For both of these photos we have printed his name over his photo (this does NOT appear on the photos in the book.) "
Click on the picture for a better resolution picture. If you want, what are probably the earliest "published" photos of Frank Zappa, this yearbook is IT. He changed schools for the 56-57 and 57-58 school years to Antelope Valley and ultimately was given a diploma from Antelope Valley, which is where he met Don Vliet and moved on to the Blackouts etc. " "Frank Zappa and I attended high school at the same time, at Antelope Valley High School in Lancaster, CA. My high school boyfriend and Frank were good friends. My boyfriend told me that Frank had a huge, wall-to-wall, floor-to-ceiling collection of albums in his room. Plus, he had a large dresser filled with 45’s. Frank could pick up any instrument, and within a few minutes could play it! He was gifted. Frank was also the school rebel. Once, in a mandatory all-school assembly in the gym, the head cheerleader went to the mike and said, “Everyone please stand and face the flag.” We all lumbered to our feet and waited. And waited some more. Then the cheerleader said loudly, “And you too, Frank Zappa.” We all turned and watched Frank - way up in the top corner of the bleachers - slowly get to his feet. We all applauded him loudly, while the cheerleaders frowned. 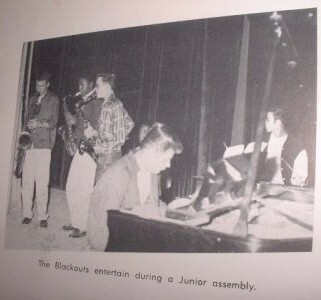 Frank Zappa’s band during high school was called The Blackouts, and they played fabulous down and dirty rhythm & blues. We loved it when they were allowed to play at assemblies. They didn’t play too often because we students would go crazy with joy, and the faculty thought we were having way too much fun. We loved that band! Frank Zappa’s Blackouts were never allowed to play at night-time high school dances because some of their music was just too suggestive for the faculty. So Frank organized his OWN dances at the town fairgrounds! Many of us girls were forbidden by our parents to attend the “wild” Blackouts dances, but of course we went anyway. The dances were great fun - the lights were low, the r&b music loud, rhythmic, & wonderful, the dancing nonstop, and no chaperones! The local police always cruised by Frank Zappa’s dances. After all, he was the town Bad Boy. Our own James Dean. 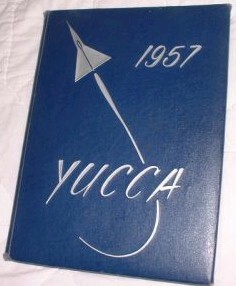 The 1957 high school yearbook has 210 pages and measures 9”x12”. 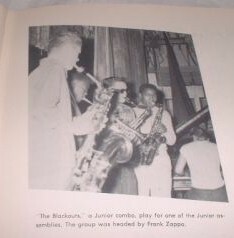 In this yearbook, Frank Zappa, in his Junior year, appears in two photos with his FIRST band, The Blackouts. In one photo he's playing drums. In the other photo he's on the piano. 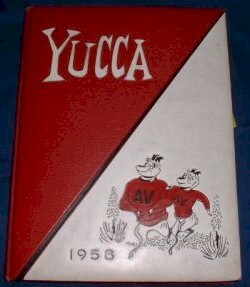 The 1958 high school yearbook has 194 pages and measures 9”x12”. 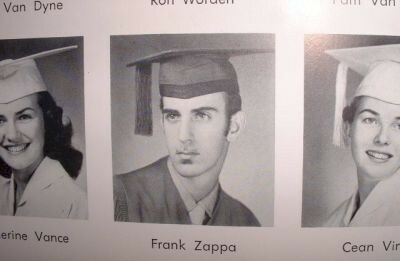 Frank Zappa, a Senior, appears in two photos in this yearbook. One is his graduation picture in cap and gown! The other is of him with his guitar. "